Read and comment on this story from the Lincoln Journal Star on PCV Patrick Obrist who is serving in the Ivory Coast and is reporting from a house in Seguela, where he and five other Peace Corps volunteers have gathered to wait out the fighting. Lincoln native Patrick Obrist doesn't usually find semi-trailer trucks blocking the road -- or military troops questioning his movements -- when he bikes from Gbogolo to Seguela. But that's about as much as the Peace Corps volunteer has seen of the failed coup attempt and continuing uprising in the Ivory Coast. "Other than just hearing about it and seeing stuff that's on the news, you don't really feel it," Obrist said Wednesday. "You're not hearing gunfire, you're not seeing bodies." The 1996 Pius X High School graduate spoke by telephone from a house in Seguela, where he and five other Peace Corps volunteers had gathered to wait out the fighting. The volunteers had been ordered to come in from villages where they have been living and working, "not only to make sure everyone's accounted for, but so we can get out quickly," Obrist said. No evacuation has been ordered yet, although the United States and France sent troops into another Ivory Coast city to safeguard Westerners caught in the nation's bloodiest-ever uprising. On Wednesday, the troops evacuated 191 Americans who had been trapped in Bouake. At least 270 Ivory Coast residents have died in battles since a failed coup Sept. 19. But Obrist said he felt no effects in Gbogolo, where he has been living for the past 18 months. The village of about 800 people sits on the border between the savannah and the rainforest -- 8 miles from a telephone and hours from the current fighting. He is working on health improvement projects, including digging latrines, and has started a chicken-raising operation to increase the amount of protein available for villagers. "In your village, it all seems kind of abstract to you because you're not touched by it," he said, noting the country had been calm since a 1999 coup. Obrist left the village Tuesday after getting the order to gather in Seguela. 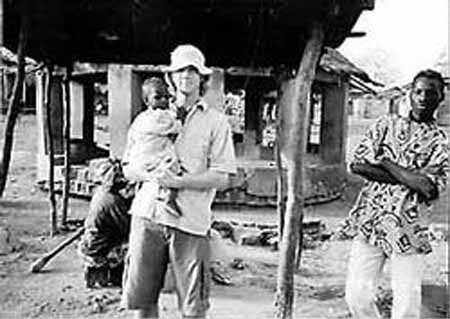 A Peace Corps volunteer in a nearby village, one with a telephone, delivered the order. A day earlier, the same volunteer had biked over to check on Obrist's safety and then give the message to Peace Corps headquarters. The relayed message was good news for his parents, Lawrence and Lorraine Obrist of Lincoln, who had heard nothing about their son since the coup attempt. Lawrence Obrist is the team leader at Lincoln's Vet Center. The couple then talked with their son Wednesday morning, when he called from the Peace Corps house in Seguela. On his way into the city, Obrist said, he encountered a blockade on the road and was questioned by government troops. No vehicle traffic was moving on the road. Inside Seguela, he found several roads blocked with trees or trucks. The city also has been put under an 8 p.m. to 6 a.m. curfew, and supplies are starting to run short. But Obrist said the curfew hours had been tighter earlier -- 6 p.m. to 6 a.m. -- and electricity, water and phone lines continue to operate. Ivory Coast President Laurent Gbagbo has pledged an all-out battle to root out rebels from Bouake and the northern city of Korhogo, the only two cities held by the dissidents. A core group of 750 to 800 ex-soldiers -- angry at their dismissal from the army for their suspected allegiance to the country's former junta leader -- were believed behind the insurgency. Paramilitary police killed the ex-junta leader, Gen. Robert Guei, in the first days of the coup attempt. Obrist said he hopes peace will return and he can head back to Gbogolo. His term in the Peace Corps runs through next spring. "I'd totally feel happy and comfortable to go back," he said. "You start like loving the people, loving the country. You're not taking any more chances than living in the U.S."
Reach Martha Stoddard at 473-7245 or mstoddard@journalstar.com. The Associated Press contributed to this report.